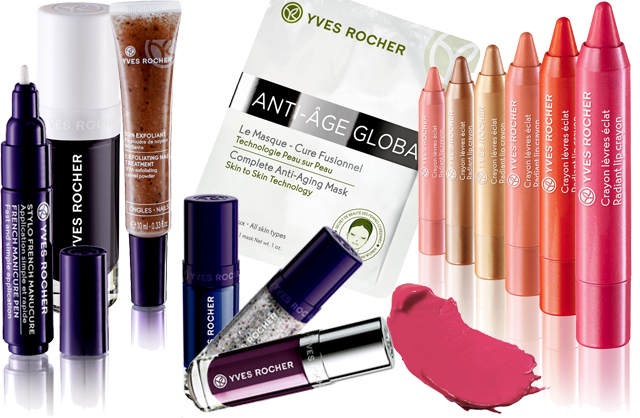 When it comes to the manicure section, Yves Rocher has really been stepping up the game! More than 50 new shades in well designed bottles will make every manicure addict's heart beat faster. Apparently one layer of the vegetal nail polish will be covering and lasting for 7 days. The brush is fan-shaped and from what I could see also has a perfect size. Furthermore Yves Rocher is not stopping here, but they will also release some pretty promising nail care products and manicure essentials. For example how about trying the smoky effect or the gel effect top coat? Or the French manicure pen? Damaged nails can be cured with the nail scrub or the 100% vegetal oil and the impatient among you will be glad to hear about the quick dry drops! The 5ml nail polishes will be available for 5,90€ and all other nail products range between 9,90€ and 13,90€. All will be available from June. Ahh! I would love to try a lip crayon from them! I've seen their make up items and would love if I could try some of them! Love the look, the concept and the brand's products in general!